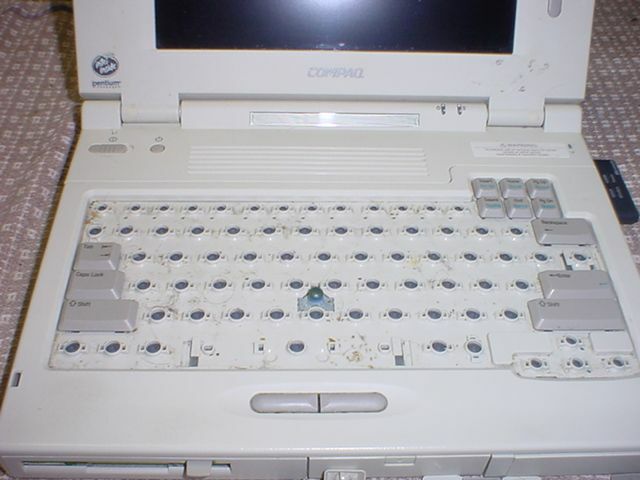 This page discusses how to safely and easily clean the keyboard on your Compaq LTE 5000 or 5000-series notebook computer. NOTICE: As with any procedure, there is a certain chance that despite your (and my!) best efforts to complete the task at hand that you could experience or cause damage to your LTE's hardware. So make sure you have the time to work on this project. I'd suggest devoting about 30 minutes to clean your computer's keyboard. That is about how long it took me to prepare all the photos for this page while I cleaned my own LTE 5000's keyboard. Please also note that while this information is believed to be accurate and it worked for me; I am providing it only on a "use at your own risk" basis. All keyboards collect an amazing amount of junk over time. The Compaq LTE keyboard is no different. Since it is a portable computer it is probably bound to collect more filth in the keyboard than most desktop computers ever will. I usually find myself eating or drinking near the computer (both are no-nos and I know that...) so the keyboard on mine usually collects some of the residue from this action. Fortunately, the Compaq LTE 5000 keyboard is easy to clean. All the keycaps pop right off with some help from a fingernail or (more likely) a small screwdriver. A lot of laptop computers don't let you take the keys off without risking significant damage to the keyboard itself. I'd strongly suggest starting with the smaller and outer keys on the keyboard. Using the blade of a small, thinly bladed screwdriver, pry the key up. It will pop up and become loose. Grab the key with your fingers and set it aside. Work your way around the keyboard while loosening and removing the keys. Do not remove any of the larger keys until after you've read the notes on doing so below. When it comes time to remove the larger keys on the keyboard, some special care is required to remove them undamaged. The larger keys have a metal bar structure attached to them. This is used to keep the feeling of the key balanced as you press it. The metal bar hooks into two small tabs on each key and on the opposite end, slides into two rails that are part of the lower keyboard assembly plastic. If you aren't comfortable removing the larger keys on the keyboard, you do not have to do so. 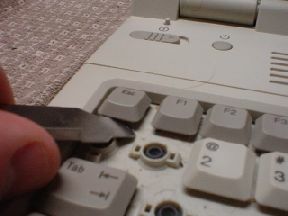 Removing the larger keys without damage is easy enough...but you have to make sure that you have done this one small extra step! Pry the key up as you would any other. Be sure you pry as close to the center of the key as you can as this is where the key is actually held into place. Now, instead of just pulling the key up and removing it, flip the keycap back up toward you as you face the machine. You should now be able to see the metal support bar and how it slides out of the base keyboard plastic. DO NOT BE TEMPTED TO JUST YANK THESE KEYS OUT! Yes, you can do exactly this but you run the risk of breaking the flimsy plastic tabs that hold the metal bar inside each keycap! When you break the plastic tab holding the bar in place on the keycap you will have a key that does not respond evenly when pushed. Gluing the tab back together (if you can even find it) is not likely to be easy or reliable. CAUTION: When using any liquid cleaner, read the directions on its use. Make sure the cleaner is safe for use on plastics. Do not use any abrasive cleaners or cleaning tools! Remove both the AC power and the battery from your LTE. While very sparing amounts of cleaner should be used (and never sprayed on the keyboard itself!) leakage could cause damage in the form of electrical shorts. Without power applied the likelihood of letting any excess cleaner dry out and expecting normal operation afterward is much greater! A vacuum cleaner may be of use to pick up any obviously loose dust before using a wet cleaning solution. After vacuuming (if needed), use a wet cleaning solution of your choosing and proceed to clean the keyboard. Apply the cleaner ONLY to a clean rag or whatever you are using to clean your LTE's keyboard. Do not apply cleaner directly to the keyboard. Wipe the lower keyboard area clean. Give it a few minutes to dry. Take each keycap and clean it separately if needed. This can be done with the paper towel and wet cleaner. 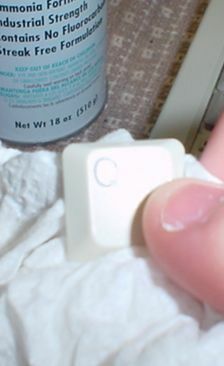 You can also use a dishwasher or washing machine to clean the keycaps as well. Simply place them in a heat-safe mesh bag and securely knot any open ends. Place the bag in the dishwasher or washing machine and use a low heat cycle with regular detergent or soap. 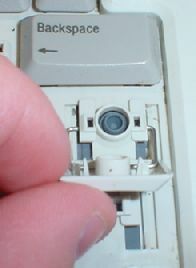 Compaq used some type of plastic-safe lubricant to ensure smooth action from the keys. Use care when cleaning the keys by hand so as not to disturb this lubricating material. If you use a dishwasher or washing machine, the lubricating material will be removed. It is not essential to replace it, but you may find that the action of the keyboard is stiffer after reassembly. If this bothers you, a small amount of a plastic-safe lubricant may be used on the posts that are inserted into the keyboard base when the keycaps are pushed down. Now that looks a LOT better, doesn't it! Reassembling the keyboard is easy. Simply push all the "regular" keys back down over the little rubber pad. You will hear a "click"and the key should now be securely in place. Press it a few times to confirm that it works normally. Larger keys with support bars require that you insert each edge of the support bar into the corresponding track on the keyboard. To do this, line up the bars with the tracks, and slide them into place. The flip the keycap down and push it firmly into place. It will make a "pop" noise. Test the key in the center and at each end to be sure it functions normally. If the key does not seem level, repeat the procedure until it is. Also check for broken ends if the bar was pulled from the keycap. I don't know if you can repair this kind of damage--it may be better at this point to get a good key from another LTE 5000 notebook computer. Please note that I don't suggest you even consider trying to remove the pointing stick buttons to clean around them. I don't know if it is possible to remove those buttons without taking the keyboard and computer apart. You could cause damage to the computer or keyboard that would be severe enough to require total replacement of either one! If you have questions, comments or need some help, contact me! Copyright ©2005-2007 by Walsh Computer Technology. All Rights Reserved. Permission is granted to reproduce this material in its entirely at no cost other than those required to cover reasonable duplicating, media or connect time expenses.